Well-aged ryes seem to be harder and harder to come by, and Jefferson's rye, which is now out of production, seems to be a symbol of this trend. After all, this 10-year rye at one point offered a well-aged rye at a decent price=point. Good luck finding this old of a rye at this price today. As was the case with this bottle, the only way to land one is on the secondary market. 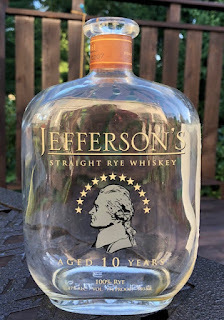 Jefferson's is a non-distilling producer, or NDP, however, meaning they don't produce their own whiskey, but rather select and bottle whiskey sourced from other producers. 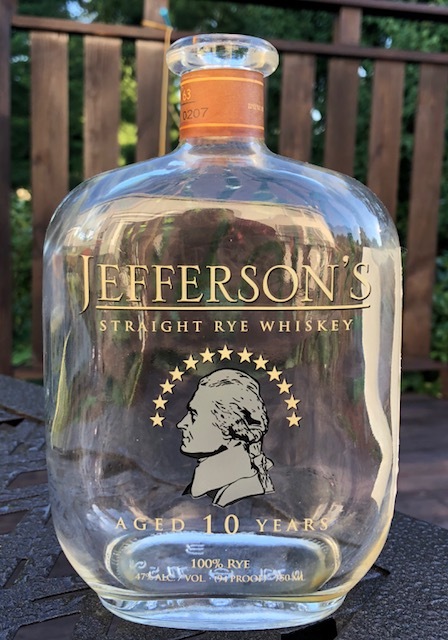 This particular whiskey, which is a 100% rye mashbill, is sourced from Alberta Distillers in Canada (despite the very patriotic branding with the Jefferson name, the profile of Jefferson himself and the arch of stars half-circling him on the bottle). Nonetheless, I was eager to try something that, in all likelihood, I'll never try again. Interestingly, as I opened this one up, I noticed that the cork was loose, as though it had contracted a bit. The bottle did not show signs of any evaporation, and as I pulled it off the bottom of the court made a tight seal. I did some very brief research on the web and found a few other mentions of this phenomenon. I'm not really sure what to make of it. The nose is soft, almost floral in nature. It has hints of cinnamon and pine, but not necessarily the spice that usually accompanies those flavors. Just mild versions of those flavors, and with little to no burn. On the palate, this whiskey is smooth and sweet. It primarily has notes of caramel and vanilla, but also has that pine flavor from the nose. The pine, though light, adds an interesting tang to the mix. Cinnamon comes in late on the back end, but while all the other flavors fade away, the cinnamon flavor seems to stick around forever. As I made my way through this bottle, I found it to be incredibly easy to drink. It is certainly inoffensive, and delicious enough to keep me going right back to this bottle pour after pour. Later pours revealed the lightest of wood tones that weren't present initially. This turned that cinnamon flavor into more of an earthy note, like a cinnamon stick. I also picked up a bot of orange peel in the mix. I didn't get this note all the time, but when I did notice it, it provided a welcome and delicious mix of sweet and bitter that had me wishing that it was just a bit more prevalent. Overall, this was a relatively simple, yet delicious rye. I went into it with hopes that it would blow me away, and it didn't quite do that. Perhaps that's a bit unfair to set the bar that high, but I really had this hyped in my head that it was going to be spectacular, and while it was very good, I just wouldn't go that far. How much was this guy on the secondary? I remember this when it came out, and it tasted like hairspray to me, but that was waaaay before I got into ryes. I'd like another shot at it.